Is Ethanol Better for Environment Than Gasoline? Ethanol—a biofuel derived from corn and other feedstocks—is already playing a major role in helping to reduce emissions from many of the traditional gasoline-powered cars on the road today. According to the U.S. Department of Energy, nearly half of all the gasoline sold in the U.S. contains up to 10 percent ethanol, which not only boosts octane but also helps meet federally mandated air quality requirements. By promoting more complete fuel combustion, this small amount of ethanol mixed into gasoline reduces exhaust emissions of carbon monoxide—a regulated pollutant linked to smog, acid rain, global warming and other environmental problems—by as much as 30 percent compared with pure gasoline. Also, a growing number of so-called “flex-fuel” vehicles now available can run on either straight unleaded gasoline or so-called E85, a mix of 85 percent ethanol and 15 percent gasoline. Ethanol proponents underscore emissions savings, cost stability (ethanol is distilled from domestically grown corn) and reduced reliance on (foreign) oil as benefits of more drivers filling up their tanks with E85 instead of gas. But even though some eight million flex-fuel vehicles are now on U.S. roads, most of them are not near convenient ethanol refilling stations and are therefore mostly running on regular gasoline. 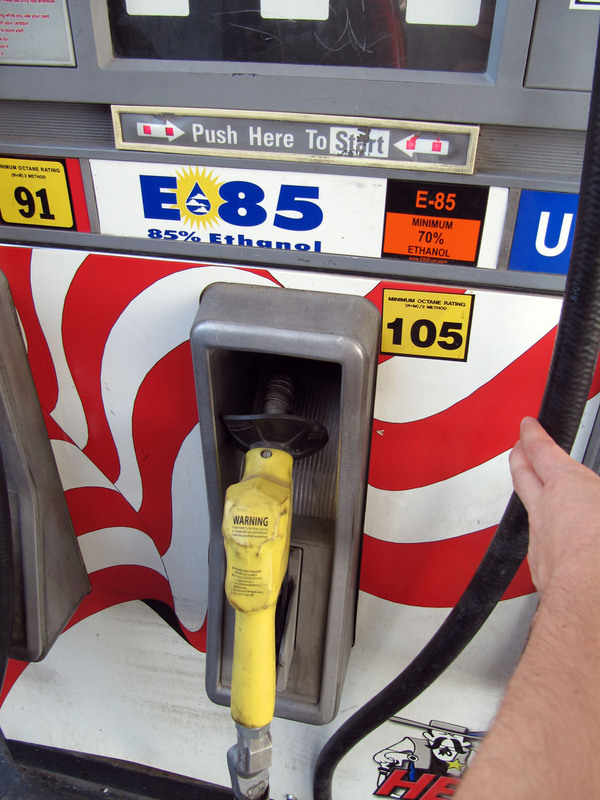 (The U.S. Department of Energy website has a map-based listing of E85 refueling stations across the country—most are in the Midwest’s “corn belt.”) So while the capacity and perhaps demand for a cleaner burning fuel is there, supplies have not kept pace—some say because the federal government has subsidized ethanol producers only and not the distributors and retailers who get the product to customers. But this may change. In May 2009 President Obama signed a Presidential Directive to advance research into biofuels like ethanol and expand their use. The resulting Biofuels Interagency Working Group is developing a plan to increase flex fuel vehicle use by making E85 and other biofuels more available. While many environmental advocates view increasing ethanol use as a promising development (if drivers would actually fill up with it), others are not so sure. Cornell agriculture professor David Pimentel argues that producing ethanol actually creates a net energy loss. His research shows that a gallon of ethanol contains 77,000 BTUs of energy for engines to burn but requires 131,000 BTUs to process into usable fuel, not including additional BTUs burned from fossil fuel sources to power the farm equipment to grow the corn, and the barges, trains and trucks used to transport it to refineries and ultimately fueling stations. Pimentel also says that powering a car for a single year on ethanol would require 11 acres of corn, which could alternatively feed at least seven people. If we step up our use of ethanol and begin putting our farmers’ yields into gas tanks instead of on dinner tables, we could see a shortage of domestically grown food and higher prices at the grocery store. To address this problem, biofuels producers are researching alternative non-food feedstocks such as algae, corn stalks, wood chips and switchgrass, though they would still make use of arable land that could grow food for human consumption. Are ‘Driverless’ Cars Good for the Environment?